Aftermarket Replacement Pads Liner for Specialized Air Force 3 Helmet by Helmet Foam Kits at Melon City Bike Club. MPN: Sair082412. Hurry! Limited time offer. Offer valid only while supplies last. MADE IN USA! 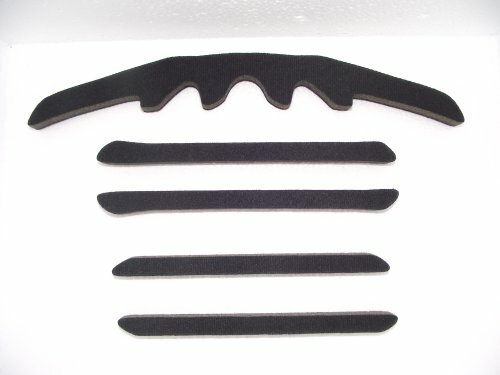 Aftermarket Replacement foam pads kit for your Specialized Air Force 3 helmet. Have your pads worn out? Need a replacement or upgrade? MADE IN USA! Aftermarket Replacement foam pads kit for your Specialized Air Force 3 helmet. Have your pads worn out? Need a replacement or upgrade? Make your helmet comfortable again! Consider that ours is 5/16 inch thick. If you're thinking about buying another kit, always ask them exactly how thick the foam is, others are only 1/16 inch which provides virtually no comfort. We take pride in the design and quality of our product. This is a great way to get more use out of your helmet that has old worn out padding. It's an excellent way to save money, instead of buying a new helmet. We are sure you'll agree this replacement kit will breathe new life back into your helmet and get you riding again in comfort. Includes FREE sticky self adhesive Hook Fastener Dot Tabs that stick to your helmet and these pads. Note: this kit is not made by Specialized, it is custom manufactured by HFK in the USA.